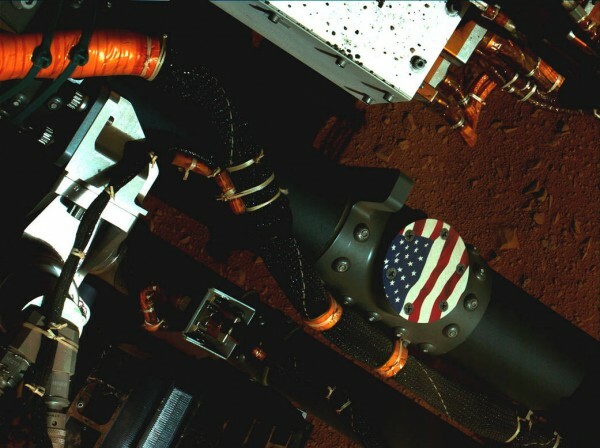 This view of the American flag medallion on NASA’s Mars rover Curiosity was taken by the rover’s Mars Hand Lens Imager (MAHLI) during the 44th Martian day, or sol, of Curiosity’s work on Mars (Sept. 19, 2012). The flag is one of four “mobility logos” placed on the rover’s mobility rocker arms. The circular medallion of the flag is made of anodized aluminum and measures 2.68 inches (68 millimeters) in diameter. The medallion was affixed with bolts to locations on the rocker arms where flight hardware was once considered, but ultimately deemed unnecessary. The other three medallions adorning the rover’s rocker arms are the NASA logo, the JPL logo and the Curiosity mission logo. The main purpose of Curiosity’s MAHLI camera is to acquire close-up, high-resolution views of rocks and soil at the rover’s Gale Crater field site. The camera is capable of focusing on any target at distances of about 0.8 inch (2.1 centimeters) to infinity, providing versatility for other uses, such as views of the rover itself from different angles.